Choose from a range of Ireland's most popular newspapers and magazines delivered to your home or office first thing each morning. To pause your delivery while you are away, simply login to your account and provide your holiday dates. Excellent consistency - paper delivered rain hail or shine. Not one delivery missed - and always on time! It's a pleasure to get up to find the morning papers have arrived. Nice to read the paper at breakfast. Great that the paper is in a sealed package due to the weather. 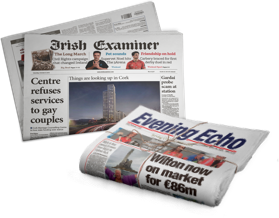 Why not have the convenience of the Irish Examiner or the Evening Echo delivered to your door? This delivery service is supported and partnered by The Irish Times. Other daily, Sunday and magazine titles also available.